I really like art work from the 50’s back, or should I say I really like the illustration work from the 50’s back. 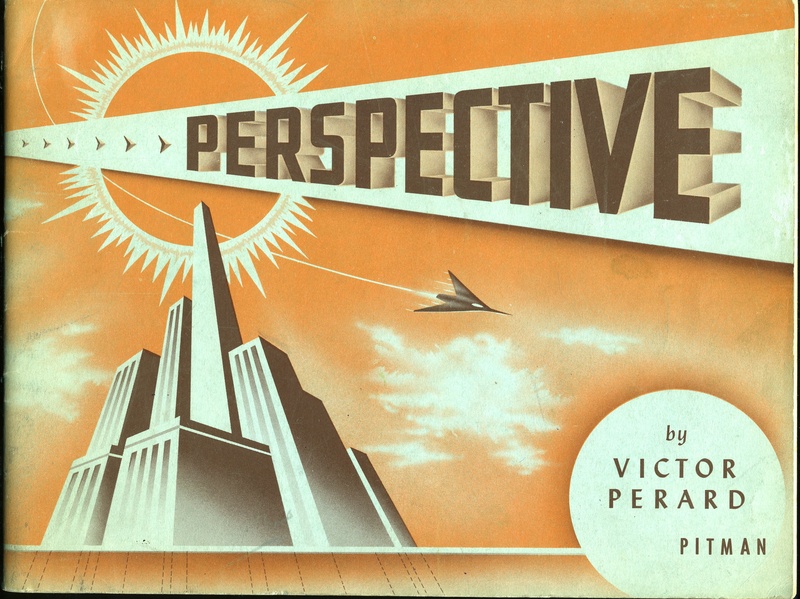 It is that type of illustration work that drew me to this simple little book called Perspective by Victor Perard, ca 1954. It’s great isn’t it? 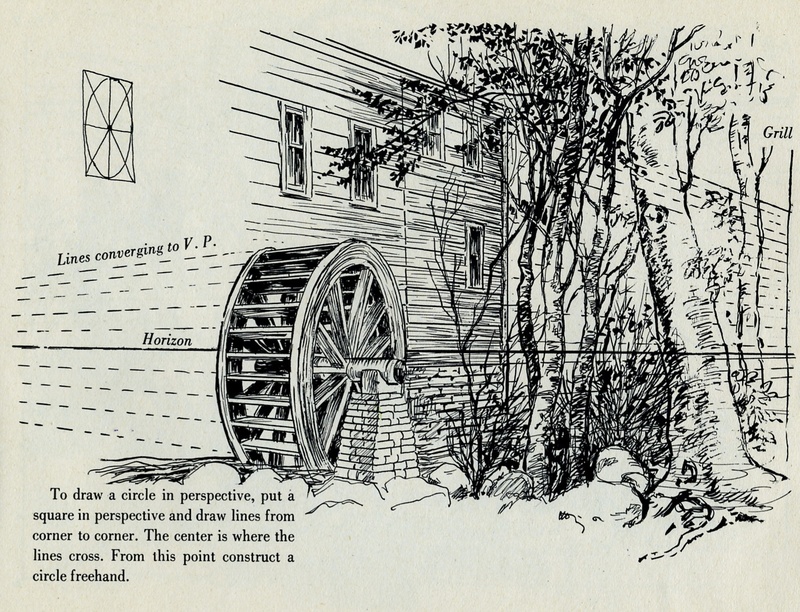 50 pages or so introducing the reader to the World of perspective drawing. The book is full of quick line drawings(mostly ink, some pencil) teaching the rules for one and two point perspective. Do you ever wander around a used book store? Well if you don’t you should, and if you do, then do look for this one and pick it up. Even if you are well-versed in perspective the book will give you a few ideas for shrub, tree, and background textures in your drawings. This is another one of those things that should be mandatory for a landscape designer. Never pass up a chance to wander through a old book store or an antique mall. Places like this are chock full of ideas, stuff, images, ah-ha moments for designers. Go in with an open mind and just go with the place. You’d be surprised at what may hit you. The vast differences in stuff/material/literature is good for creative connections, especially of the odd sort. Odd sort as in two things that have no business going together creating a possibility for a solution you need, to solve a particular problem. As for books, again creative connections. The putting together of two things that you never thought went together. How about an example. I once found a book on elocution(ca 1900) that had a set of images depicting certain emotions e.g. angst, shock, joy, etc. I scanned those images from the book and have used those them in Powerpoint presentations to advance a thought/idea/motivation. Wandering/perusing/browsing is time well spent. A time in exploration and using different thinking patterns and thought processes away from the desk or drawing table. Believe me that is time that is always well spent. I also suggest taking some time when you’re really busy . . . why? To bring the heart rate down, the constant find-a-solution time down, It’s a great break, and who knows what you’ll find . . . maybe even the next ah-ha you’ve been needing . . . solving that problem sitting back on your desk. p.s. never forget your pad/moleskine/pda-whatever to jot those great ideas down. I have more of these type(s) of books to share and will do so every now and then. Thanks for posting the large scan of the cover. I actually did notice this book in an antique mall, but didn’t buy it because I have zero drawing ability (yes, attempts to train me have been made). Then later I thought “so what, I still want that awesome cover” but when I went back it was gone. You’re not the 1st person to walk away from a book, go back later and to much chagrin, find that the book is long gone. Please include me in that list of people. Glad you enjoyed the scan(s).